With fewer than 60 individuals left, the world’s smallest porpoise, the vaquita marina (Phocoena sinus), continues to balance on the edge of extinction. Constant pressures from conservation groups have lead to a two-year emergency gillnet ban, which will end in May 2017, and government-led efforts are now pushing fishers to use gear that won’t threaten the vaquita through bycatch. 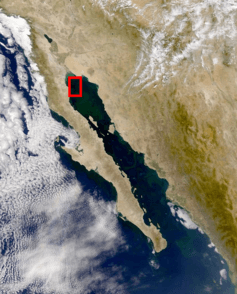 Despite these steps, in a new study my colleagues and I warn that unless further big changes are made in the Upper Gulf of California, Mexico, we may soon be saying goodbye to this charismatic little animal. The history of vaquita conservation is long and convoluted. It has been characterized by intermittent top-down management interventions that have often had little more than short-term outlooks. These have perpetuated the decline of the vaquita population, which is now estimated to contain less than 25 reproductively mature females. The new Conservation Letters study describes how the gillnet ban now in effect, and the introduction of new trawl gear may address the immediate problem of vaquita bycatch but even taken together, they will likely be yet another short-term – and, most likely, ineffective – attempt to pull the vaquita back from the brink of extinction. The end of a day’s fishing in the Upper Gulf of California, where conservationists fight with fishers over the declining populations of the vaquita marina porpoise. Gillnets sit in midwater and are made of fine line, which is difficult to see in the Upper Gulf’s murky waters. Similar to almost all cetacean bycatch, vaquita are unable to free themselves once entangled and risk being drowned while held under water. Trawl gear is an alternative that reduces the risk of bycatch. These heavy gears are towed along the seafloor catching any animal not quick enough to outswim the mouth of the approaching net. The mouth of the net is much smaller than the area of a gillnet, which reduces the effective catch area that poses a risk to the vaquita. Also, the use of trawl gear is noisy, more easily visible and therefore more easily avoidable than gillnets for cetacean species. 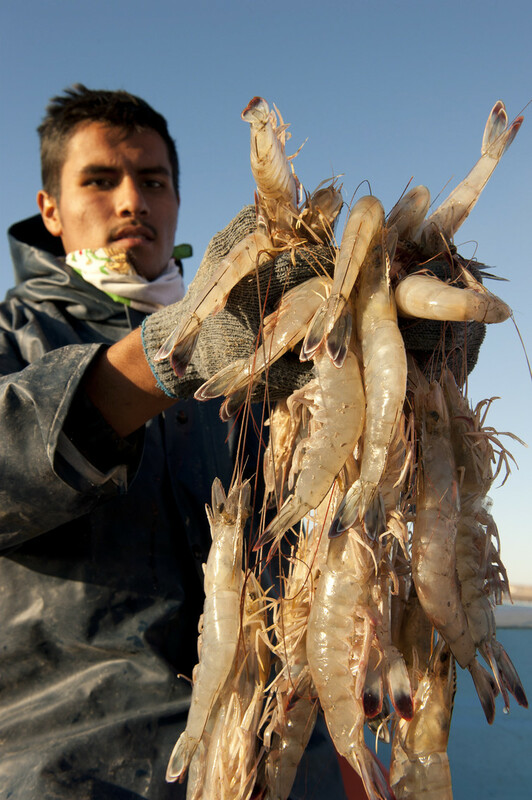 A young fisherman in the Upper Gulf of California, Mexico holds up his prawn catch, caught with gillnets that threaten the vaquita’s survival, yet earn the local fishers a healthy livelihood. But this alternative is more expensive. After accounting for lower catch rates, higher fuel expenditure and the cost of the switch from gillnets to trawls, we estimated that an annual subsidy of at least US$8.5 million would be needed to compensate fishers in the Upper Gulf for loss of employment and earnings. Long term, the economic losses from the new management interventions could have one or two side effects: 1) a reliance on subsidies and/or 2) increased illegal fishing activities. What’s more, an endangered yet highly prized fish is caught in these waters with gillnets. Swim bladders known as buche from the endangered totoaba (Totoaba macdonali) can sell for tens to hundreds of thousands of dollars per kilo, depending on the size of the bladder and the demand of the Chinese market. This “aquatic cocaine” complicates the plight of the vaquita because illegal fishing to catch the totoaba pose a risk to the few vaquita that remain. There are also significant ecological risks to the new management plan. The impacts of trawl gear to seafloor species are significantly greater than those posed by gillnets because they are dragged along sea floors, reducing productivity in many shelf sea ecosystems and negatively affecting community compositions and diversity. In just 26 days of gear testing in the Upper Gulf prior to the the gillnet ban, 30 percent, or 2,819 square kilomters (1,715 square miles), of the Upper Gulf biosphere reserve’s total area was scoured by the new trawl gears. Longer term, we warn in our study this could have severely detrimental consequences for the health of the Upper Gulf marine ecosystem. 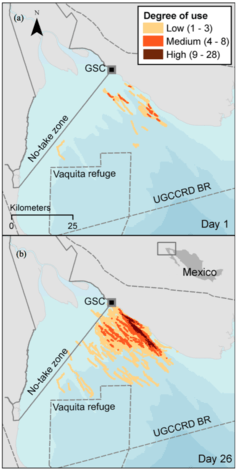 Trawl tracks after (a) 1 day and (b) 26 days of gear-testing in the Upper Gulf of California, Mexico. My colleagues and I believe there is little use in pointing the finger of blame at this point, as seems to be the case in many articles discussing the fight for the vaquita. Instead, the vaquita situation urgently needs a new way of thinking, a paradigm shift. Consistent exclusion of fishers from the design of management plans, typically driven by conservation groups and implemented by the government, has led to polarized opinions and a large divide between what should be a close collaboration between fishers and conservation agencies. Rushed, short-sighted management must be replaced by longer-term goals that involve local communities and address conservation challenges associated with both the vaquita and the totoaba. Community support of management measures, in particular, seems essential for long-term success in conservation stories. We recommend that the local communities in the Upper Gulf require external investment. Specifically, the development of infrastructure, such as road networks to connect fishers to new markets and processing facilities, would benefit the current situation by providing new employment opportunities as well as increased returns on ever dwindling fish catches. Education is also key. This should include programs to educate fishers in the consequences of unsustainable fisheries practices, techniques to help add value to their catches and alternative livelihoods to fishing such as tourism or potential service industry employment. Vaquita are found only in the uppermost Gulf of California, Mexico. 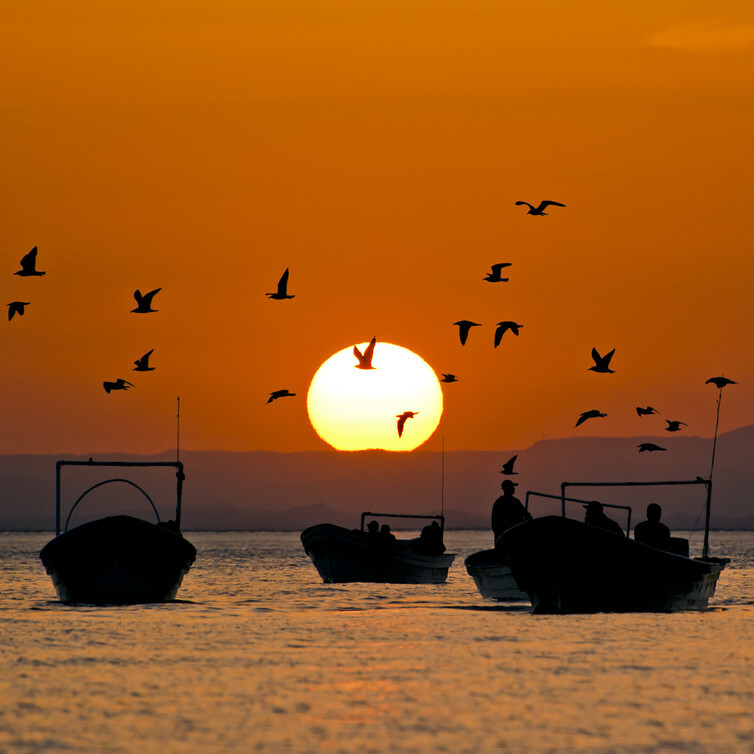 At present there are few employment alternatives for fishers in the Upper Gulf. Often, men are recruited into the fishery as young as 15 and the common story of “once a fisher, always a fisher” prevails. We highlight that an investment in education could both help promote marine stewardship as fishers better understand the longer-term consequences of current fisheries practices. It could also provide the younger generation with the training to build new business or follow paths in higher education instead of joining the local fisheries. As with many of the world’s ecological problems, overcapacity seems to be key. In the case of the upper Gulf fisheries, too many people are catching too many fish from finite stocks. Continued overexploitation of any natural resource ultimately means communities risk destroying the finite natural resources they depend on. To put it simply, communities in the Upper Gulf of California need help to reduce both the number of fishers currently fishing and the number of future fishers entering the fisheries. This will help promote alternative, nonextractive activities in order to alleviate the impacts that current fisheries practices have on fish stocks, the vaquita and, with the new trawl gear intervention, sea floor habitats. 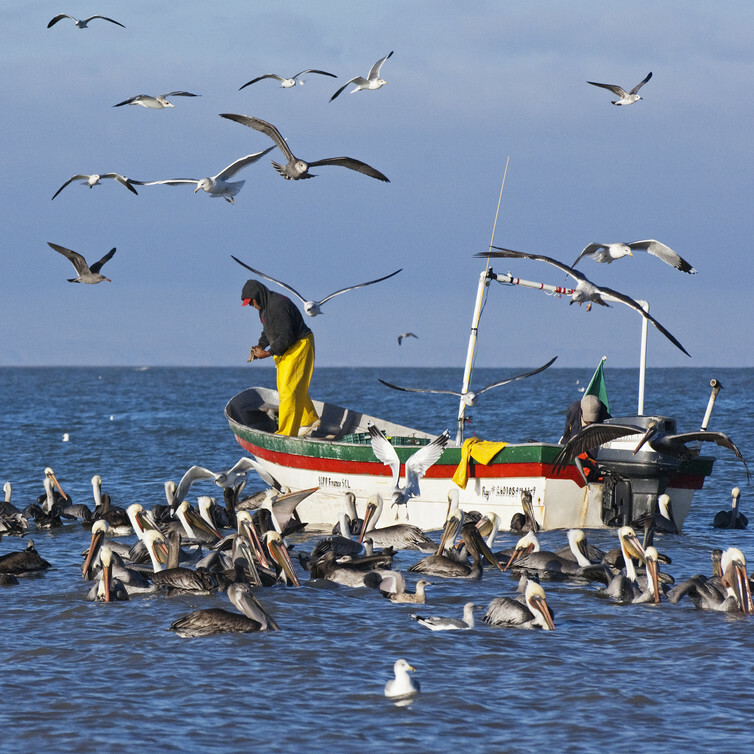 A fisher in the Upper Gulf of California, Mexico tears up old fish to feed to the pelicans. A meeting in late July of this year between Presidents Obama and Peña Nieto concluded with a tentative proposal for a permanent extension of the Upper Gulf’s gillnet ban and a crack down on the totoaba trade. Although eliminating vaquita bycatch is crucial for the species’ survival, ignoring economic losses, local livelihoods and new ecological problems related to trawl impacts, the Mexican government may have missed the point again. With one foot of the vaquita firmly in the grave, now does not seem to be the time to make somewhat incomplete decisions regarding the survival of the vaquita, the health of the Upper Gulf of California’s ecosystem and the social well being of the families that live in this remote area of Mexico. April 22, 2019, No Comments on Will Netflix eventually monetize its user data? April 17, 2019, No Comments on New cholesterol study may lead you to ask: Pass the eggs, or pass on the eggs?